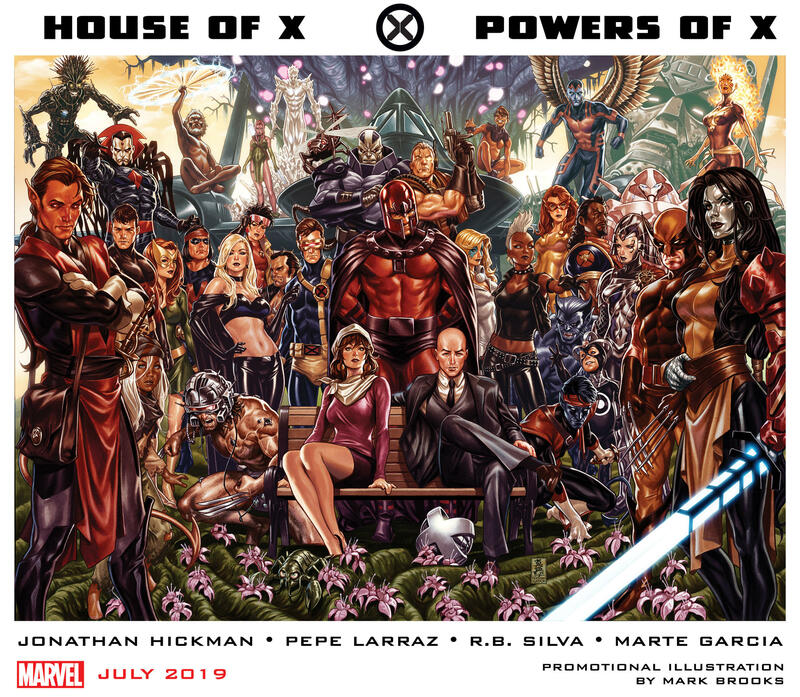 Jonathan Hickman to launch 2 new X-Men series: 'House of X' and 'Powers of X' this July – AiPT! The rumors were true–acclaimed writer Jonathan Hickman (Fantastic Four, Avengers, Secret Wars) is coming the X-side of the Marvel Universe and, I’m going to assume, nothing will ever be the same for Marvel’s merry mutants! At Marvel’s “Next Big Thing” panel at C2E2 2019, the publisher announced that Hickman would launch not one but two new six-part X-Books–House of X and Powers of X this July. The two series will alternate on a weekly basis, with Extermination artist Pepe Larraz handling House of X and Uncanny X-Men artist R.B. Silva on Powers of X, with Marte Garcia providing colors for both. Marvel stated that the two series will build from every major X-event since the team’s debut in 1963, which explains all the history on display in artist Mark Brooks’ promotional image. It should be noted that we’ve already received a few sneak peeks at these series’ interior art via X-Men Senior Editor Jordan D. White in AiPT!’s weekly X-Men Monday feature. Revisit those two exclusive previews below and be sure to check back Monday for more from Jordan on this eXciting new X-Men era–we’ll have one more new image to add to the collection.